We offer a dynamic combination of advanced technologies in one convenient location. Many practices would refer you to several offices to accomplish the same care. The best that dentistry has to offer combined with personal service and down to earth discussion of your care will make your experience with Dr. Jorge E. Larrondo unique from other practices. If you’ve avoided the dentist for years due to bad experiences in the past, you can now comfortably snooze through even the most complex care, thanks to Dr. Larrondo Sedation Dentistry. Complex treatment that used to require many visits or even months of treatment can now be completed in as little as one single visit with my methods. Experience Dr. Larrondo Sedation Dentistry just once and you will never be afraid to go to the dentist again! Our no-drill dentistry is a leap into the future that allows removal of dental decay without the dreaded whine of the drill and often without the needle, too! The technology uses forced air and a safe, small particle substance to etch away decay rapidly and without the vibrations and heat of the dental drill. It can get at decay sooner because it is a fine spray, so you can keep your natural teeth for life. Few clients need anesthesia of any type. We use an advanced dental laser to gently and effectively treat the ravages of gum disease usually without numbing anesthesia. It helps stop the progression of tooth-destroying and bone-destroying disease. Laser treatment helps to eliminate the need for conventional, often painful, gum surgery in up to 75% of cases. The laser can also be used to gently and artistically refashion the gum line. It can turn short teeth or a gummy smile into the smile you’ve always wanted. It also improves the result and accuracy of complicated dental procedures. This new type of anesthetic allows numbing of gum tissue for comfort during deep cleanings, without the need for the old-fashioned “stick” of the dental needle. It has been featured on NBC’s “Today Show” and in “SELF Magazine”. I am proud to be one of the first doctors to adopt its use. For clients undergoing treatment to halt infections in the gum and bones that cause tooth loss, my hygienist often uses a type of antibiotic that is completely painless. This means the antibiotic is more effective because the infection is “hit hard” by its direct application to the problem. It also means that you don’t expose your whole body to an antibiotic, so that medicine will remain more effective in the future against bacteria. The root canal is a procedure that has kept many people away from the dental office-including those who might not need one–due to the bad reputation behind the term. Much of the fear came not so much from the discomfort, but from the technique used. In many offices, it’s still a manual and imprecise mechanical process. At my office, I use the latest technology. I can precisely locate the apex of the root electronically and with a computer-controlled device. I can then remove the damaged or diseased root efficiently and more comfortably. Replaces missing teeth, bridges, dentures, and partial dentures for return to natural chewing. For those with dentures or with missing teeth, the most life changing service dentistry offers. Surgery and prosthetics performed in on convenient location-few offices can do this. Stops bone loss and facial changes related to missing teeth. An alternative to root canals in some cases. Reduces chance of further tooth loss over all other treatment options. Ensures that muscles, ligaments, and jaw joints are in a physiologic and healthy state when the teeth come together. Sonography (sound analysis) of the jaw joints allows for early detection of deterioration in the jaw joints and prevention of further problems. Allows for treatment of deteriorating joint conditions and relief of symptoms. 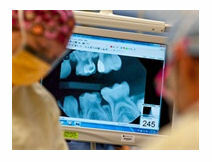 Allows for computerized planning for the rebuilding of the dental bite in complex cases or where teeth are no longer present. Allows for planning of orthopedic orthodontics for healthier orthodontics. Helps identify patients who are at risk for joint and tooth deterioration. Keeps mercury form the removal of old “silver” fillings from entering the waste stream (we don’t use mercury in any of our procedures). Detects blood flow problems in the jaw joints. Ability to check benefits and submit claims more rapidly. Larrondo Dentistry is located at 160 S. Santa Fe Street, Hemet, CA. Contact us by phone:(951-925-6596)!